This entry was posted on April 10, 2019 by Chris Elliott. 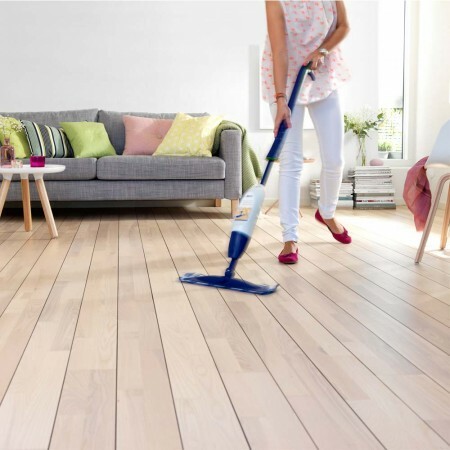 To keep your wooden floor dust and dirt free you should sweep the surface every day. Use a soft bristle brush as it is delicate but effective. You can use a vacuum cleaner, but it should have an attachment designed for wooden floors. After sweeping, you should clean your floor at least once a week. If it is a busy area like a hallway or living room, you may want to do this more regularly. Use a wood floor cleaning spray and micro-fibre mop. The Bona Wooden Floor Cleaning Spray is ideal as it has a removable pad, spray handle and refillable cleaning solution. Your wooden floor can absorb water or any type of liquid that is left on it for a while. It is essential that you wipe away excess water as soon as you notice it. If it is left to soak in, it may leave water marks on your floor, or even cause deeper water damage to the planks. Please remember to take off any wet or dirty outdoor footwear before walking on your hardwood floor. Small pieces of grit or stones could scratch your wooden floor if walked on. It will also mean that you won’t need to wipe away dirty footprints. We always recommend that you use doormats at all entry doors. This will help to catch dirt and water before it has the chance to get onto your floor. This is especially important if your wooden floor leads straight onto an entrance door (e.g. a hallway, conservatory or any room with an external door). To reduce the chance of scratching or marking your floor, we suggest using felt protector pads. These simply go on the bottom of furniture (or any heavy object) and create a soft barrier between your floor and the piece of furniture. They are available in a variety of shapes and sizes. A steam mop is great for tiles but can cause serious damage to your wooden floor. The steam can penetrate into the wood and cause it to swell, which consequently can cause the floor to discolour and warp. For more information, have a read through: Can I use a stream mop on my hardwood floor? If you always lift, carry and gently place down heavy items when moving them, you will reduce the risk of scratching your floor. If you drag things (such as furniture, washing baskets or heavy toys) across your floor, they could cause dents, marks and scratch the surface. Furniture polish is designed for furniture – not wooden floors. If you use it on a wooden floor it can create a slippery residue that is extremely difficult to remove. As a result, your floor may be dangerous to walk on. Some cleaning products can be harmful to your wooden floor. Always check that a product is pH neutral and is suitable for use on hardwood flooring. Avoid any products that are acidic or abrasive. For more detailed advice and tips about cleaning and looking after your wooden floor, read our Wood Floor Maintenance and Care Guide.